You will never believe where "Cube It Or Lose It" was born. You will never believe where “Cube It Or Lose It” was born. By now, most people know that the Gold Cube is designed for the small gold. The big stuff can be captured by the 1800 technology, AKA a sluice box. 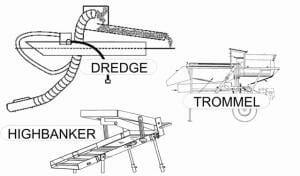 Dredges, trommels, and high-bankers all have sluice boxes with riffles. That’s good news for the miner in an area with chunky clunker gold. Problem is, most of that big stuff was pulled out over many years of mining. Good news is, there is a lot of the little, smaller than sugar, flour gold out there to be had. Want to know where the slogan was born? Well let me tell you. As some of you may know, Gold Cube has been at every single Gold and Treasure Expo the GPAA has put on since our very first show in El Paso Texas, January 2011. We were at a show in St Joseph Missouri, 12 October 2012, it was a Friday 1:30 pm the temperature was 71 degrees, no breeze and I heard a dog bark and the moaning of a train in the distance. OK, fine! I at least know it was Friday and we were setting up for the Expo. Most shows we do, we get some help from the good folks from the local chapters that are hosting the Expo. They will help cart our wares from the trailer or the Gold Cube shuttle, to the booth for set-up. All this help really moves things along great! Well, never before and never since have we gotten so much help from any other chapter . Red and I were in the shuttle pushing boxes to the door so they could be carted in, and volunteers per stacked 5 deep pushing each other to get to the door. Someone pulled up with a wheeled cart and hollered, “Move it, or lose it” Red, sliding a box, all bent over said “yeah! Cube it or lose it!” and just kept pushing the box. I said RED! did you hear what you just said? He said no!, what did I say!? You said “Cube it or lose it” That’s it! That’s what we have been trying to tell people! That’s out new slogan! I went to the door and looked out over the crowd and proclaimed our new slogan. I recapped for them the scene as I did just now for you. I let them know that right here, right now our slogan was born. “It was because of too much help, and too many people getting in the way that move it or loose it was said. I just thank God, I actually listen to Red, even though he won’t listen to himself.” Laughter and applause broke out and 10 minutes later, we were minus a load in the shuttle and plus a new slogan. Thank You St. Joseph, the great helpful people, and a great show that i saw friends I’d never met before, But that’s another story.